You’ll want this one. This is the best Thai red curry out there and this recipe is absolutely fail-proof and you don’t have to import Kaffir lime or Galangal ginger from Thailand. You have my guarantee. What’s my guarantee? If it doesn’t turn out good, you can come here to my blog and swear/complain all you want and I wouldn’t retaliate. But you really wouldn’t have to. Just follow the recipe and don’t skip any of the ingredients and you’ll be on your way to a stunning restaurant grade Thai red curry. I say this with confidence because I’ve messed up before and spectacularly. I’ve not been to Thailand and I don’t know if Thai red curry is different there. I am talking about the Thai red curry in good Thai restaurants (Benjarong, Lotus and the likes) here. So purists who cannot tolerate substitutions, this may not be for you. I love a good substitution and this curry has a few beautifully apt substitutions. 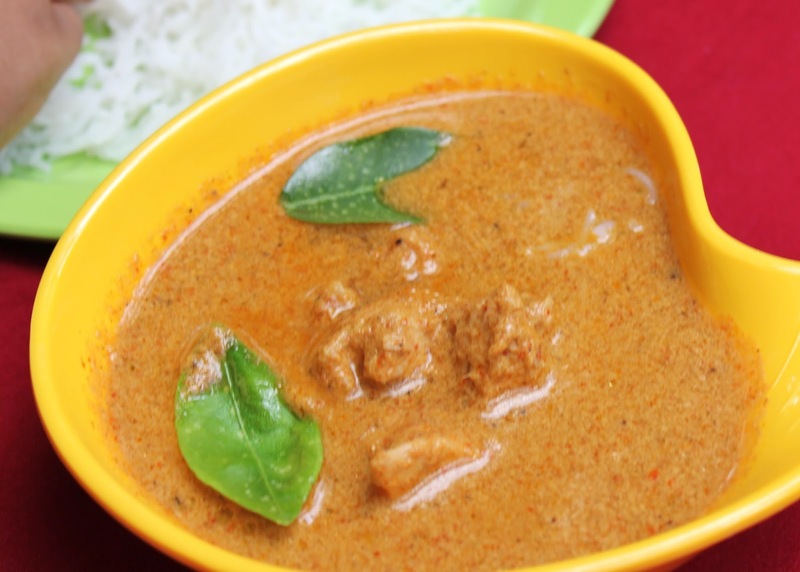 For those new to Thai cuisine, Thai red curry is a beautiful, aromatic curry (could be vegetarian or non-vegetarian) that is traditionally served with long grained steamed rice. 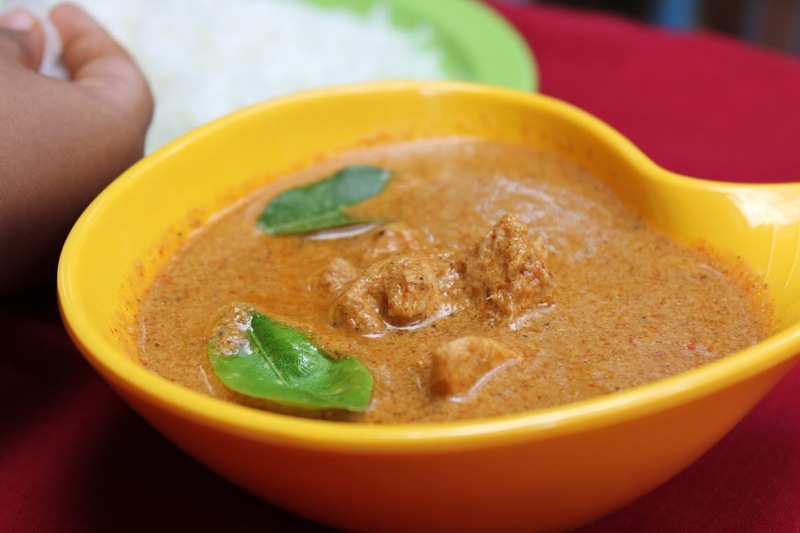 The crux of the red curry is the red curry paste which is fried and then simmered in coconut milk. The ingredients that go into this curry paste are plain beautiful. We’re familiar with most of these flavours in Indian cooking but not in this combination or intensity. Lemon leaves, coriander root (or stems, the stuff we discard usually) fresh ginger.. Can you imagine how divine this must smell? The guy who thought of this combination is a genius. If you didn’t make out by now, I am a huge fan of Thai cuisine and I am not the type who orders the same thing every-time I go to a restaurant (I like to experiment, screw up), but with Thai food, it’s always Thai red curry for me. I followed my instincts this time and didn’t follow any one recipe but combined and edited a few recipes (which among others includes a Goodfood magazine recipe and a Nita Mehta recipe) to arrive at my Thai red curry recipe. If you do have Kaffir lime, galangal ginger and birds eye chillies (cute looking little red chillies) by all means use them. I’ve listed both the original and the substitutes below so that you can use whatever you have handy. 1. Dry roast the cumin and coriander seeds on low heat till fragrant about 2 minutes. 2. Dump all the curry paste ingredients in a mixer and grind to a coarse paste. 3. Heat oil in a kadai and when hot add the curry paste to it. Fry till oil separates – about 5-8 minutes. Then add the chicken pieces (or vegetables if you’re making a vegetarian curry), red chilli powder, salt and coconut milk. Mix well. Cover and let cook on low for 15-20 minutes or till the chicken (vegetables) is cooked through, the curry is a nice orange-red shade, has thickened a bit and the oil floats on top. During the last 5 minutes throw in the whole lemon leaves (saving a couple of leaves for garnish) and lemon grass pieces and let simmer. Taste and adjust seasoning. Uncover and simmer for another minute. 4. 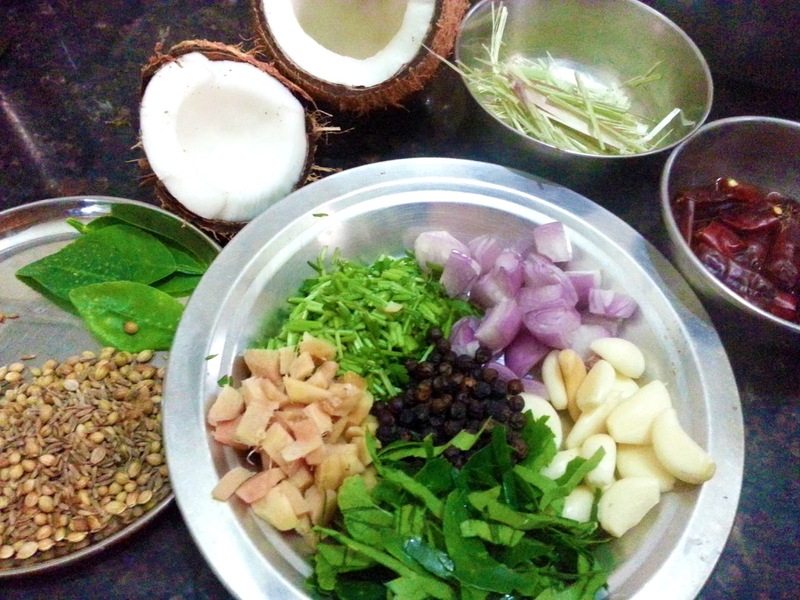 Garnish with fresh lemon leaves and serve hot with steamed rice. 1. To make a vegetarian red curry, you can use a combination of mushrooms, babycorn, capsicum, bean sprouts and carrots in place of the chicken and reduce cooking time by 5 minutes. If using capsicum, add capsicum towards the last 5 minutes as it tends to cook fast. You could switch these vegetables for others as well. 2. Most Thai curry recipes (I suspect they’re all western generalizations) suggest cooking for just 5 minutes or so after the coconut milk is added. I don’t think chicken or even vegetables cook that fast and moreover for the curry to get that curry consistency and taste, the flavours need to blend and the curry needs to cook longer. Coconut milk doesn’t curdle like milk but the texture changes and that’s exactly how the Thai curry should be (not smooth). You know how Indians always wait for the oil to separate. Well that’s when the dish is cooked through. Indian wisdom for you. This entry was posted in Chicken, Fish & Meat, Dals, Kormas & Gravies and tagged chicken curry, coconut milk based curry, curry, gravy, recipe, red curry, red curry paste, thai chicken curry, thai curry, thai food, thai red chicken curry, thai red curry, thai red curry and steamed rice. Thanks !! It was indeed very easy to do….. Life is so much easier now with ready to use Curry paste also available.